OK. So this is the fourth dessert recipe in a row. But then one can't resist but post them as it is the holiday season. Besides that, who can resist a dessert which comes with the name "Sita Manohara" which literally means one how steals Godess Sita's heart that being Lord Rama. Isn't that fascinating? 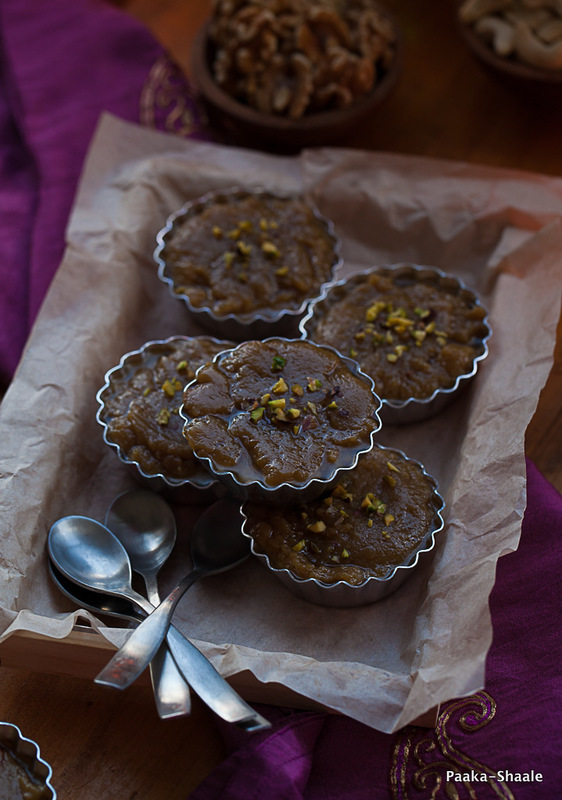 I was introduced to this rich and scrumptious dessert by my cousins Bhushini and Renu. Both cousins, are accomplished High court Lawyers by profession. Apart from that, they are also great cooks. 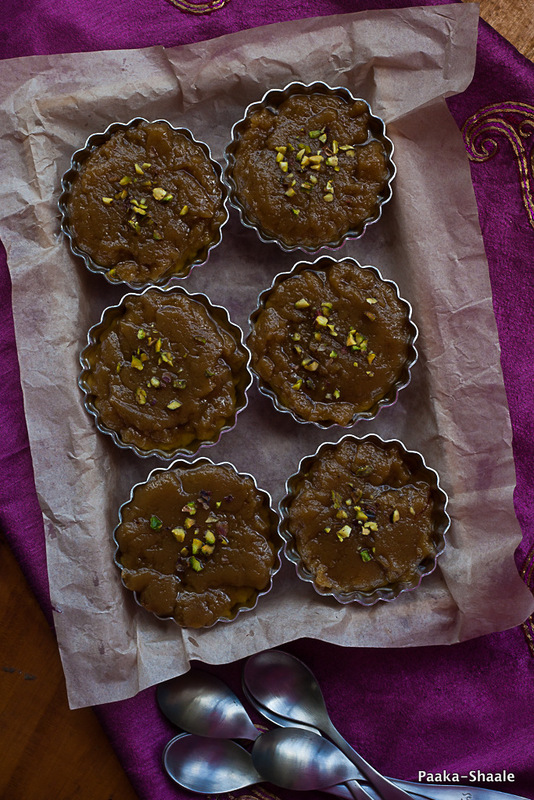 They can conjure amazing laddus, halwas and large batches of sun dried condiments. I first tasted this dessert when they had made a large batch of this dessert for a family get together. I took one bite of this warm dessert and I was smitten instantly. I decided that I would make this for our anniversary at that very instant. 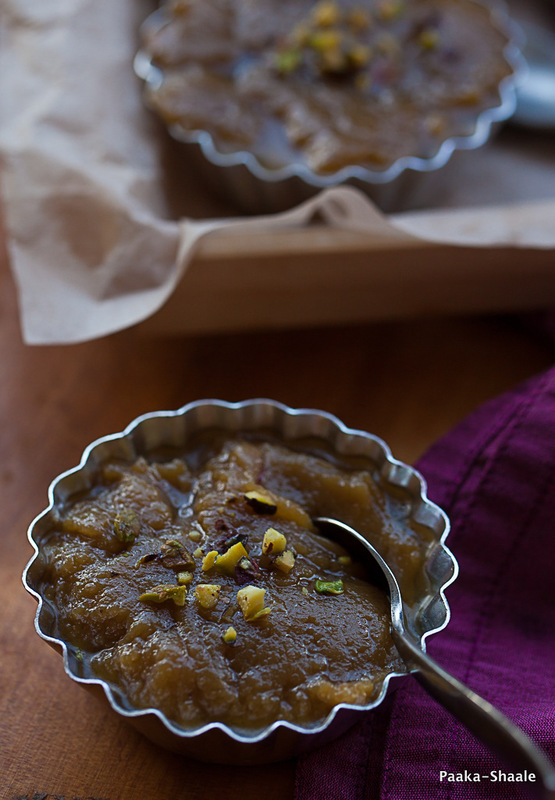 This dessert is a mixture of almonds, cashews, walnuts, milk, sugar and clarified butter. I found this a little unusual. That's because, I had never made anything with walnuts as a main ingredient. Since my man is not a big fan of walnuts, I avoid buying them. 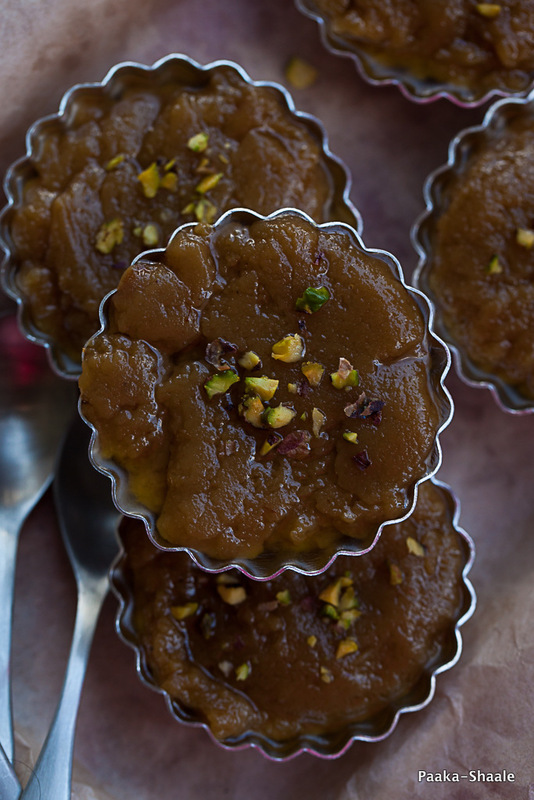 So it came as a pleasant surprise when S loved this halwa. 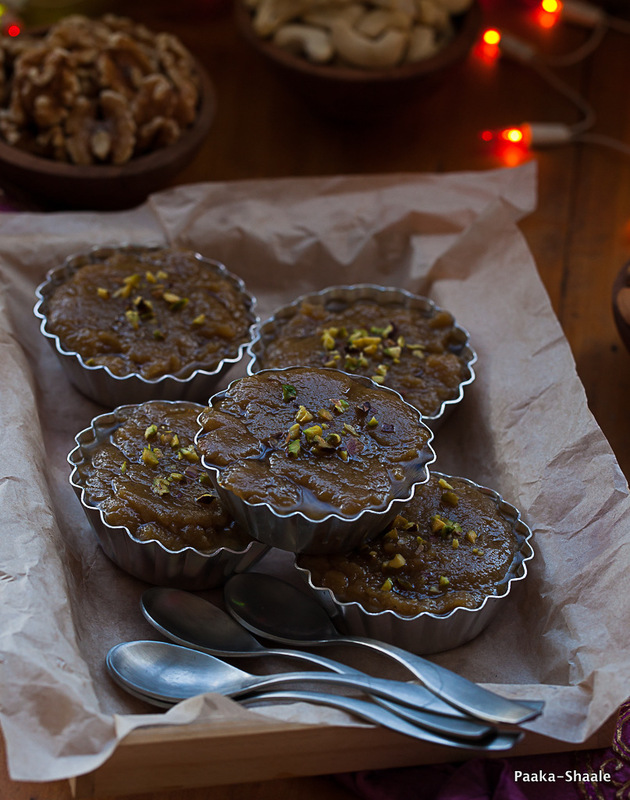 So if you are looking for a scrumptious dessert for this holiday season, I suggest you give this warm dessert a try. I am sure this will become a part of your recipe repertoire. Soak the peeled almonds, cashew nuts and walnuts in milk for atleast 5hrs or overnight. 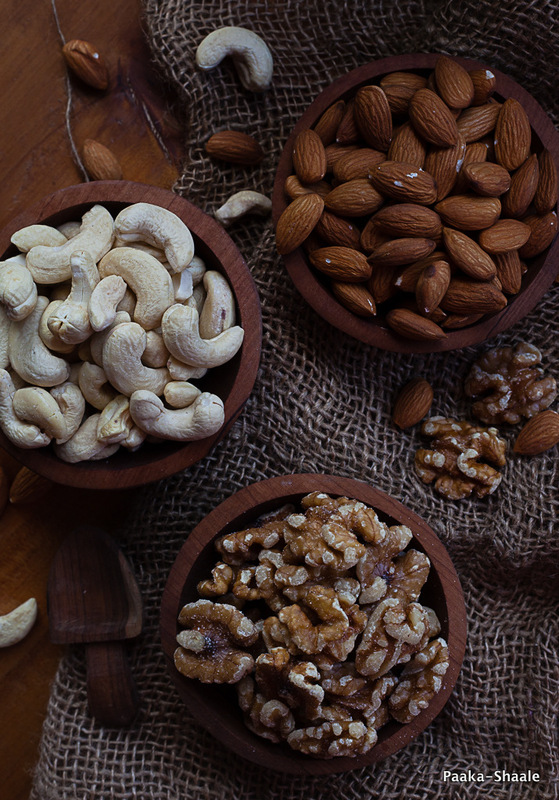 Blend the soaked nuts in a blender to fine paste and set aside. Heat half cup of ghee in a thick bottomed skillet and add the ground paste, sugar and the saffron mixture and mix well and cook the mixture on medium flame. Continue mixing so that the mixture does not stick to the bottom and burn. Keep adding the ghee half cup at a time and continue the mixing till the mixture changes color and starts leaving the sides of the pan. This will take about 30-40min. Once the mixture is cooked completely, take off the heat. Garnish with pistachios and serve warm. Never heard of this name :-), beautiful dessert floating in the richness of ghee!